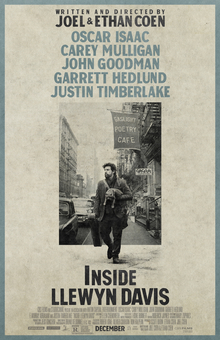 The final film in my Coen Brothers retrospective, ‘Inside Llewyn Davis’ is a brutally honest look at someone searching for fame, and never quite getting there. Llewyn Davis (an excellent Oscar Isaac) is clearly talented, but he’s not quite talented enough (this being showcased in a beautifully heartbreaking scene with F Murray Abraham’s music exec). The film is an excellent character study, without forsaking the Coen Brothers talent for terrific small parts (John Goodman in particular is great), and terrific moments (the rendition of Please Mr Kennedy is a fantastic culmination of music and acting). The film is set in New York’s Greenwich Village amidst the 1960’s music scene, which led to the discovery of numerous talents (Bob Dylan being one of them, as slyly alluded too in the film), and the attention to period detail and production design is superb as we’ve come to expect. Isaac excels in the lead role, and he manages to make the character compelling despite his moody and unlikeable initial appearance. One of the things I enjoyed the most about the film was the quality of the music – the aforementioned Please Mr Kennedy is terrific and its clear Isaac, Justin Timberlake and Adam Driver are having a ball, and the rest of the music throughout is excellent. It doesn’t hit the heights of their finest films, but this is a sad, funny and heartbreaking movie about searching for fame, and the simple fact that most people don’t even get close. I’ll be taking a week off before jumping into David Lynch as my next selection in a fortnights time. At this stage, I’ve only seen Mulholland Drive, The Straight Story and The Elephant Man, so I’m looking forward to getting my teeth into the rest of his collection!